Huh, There’s a West Timor? Most people are more familiar with Indonesia’s neighbor, East Timor, due to its 25-year struggle for independence, which often splashed in the headlines of Western papers. This long and violent battle for independence has resulted a strong UN presence and continuous aid relief efforts in East Timor. 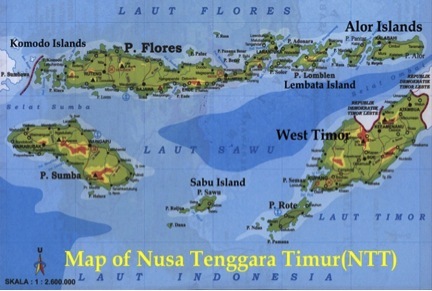 In strict contrast, West Timor of Indonesia’s Nusa Tenggara Timur (NTT) province was left out of the limelight. Today NTT province still has the least favorable social and economic statistics of all 33 Indonesian provinces. Many of the statistics in the table below are shocking, especially the fact that 65% of the 4.6 million population is living below the poverty line and earning less than 1.00 USD per day. Tanaoba Lais Manekat (TLM), the MFI, which Kiva is partnered with in NTT province, has a dedicated mission to alleviate poverty in West Timor and its surrounding islands. Currently TLM has 19 branch offices throughout NTT and has reached 26,985 clients through its loan and savings programs. I’m thrilled that my Kiva Fellowship has granted me the opportunity to work with such a committed institution. With my Kiva experience out in Indonesia, I am also able to report back home to everyone that YES, there indeed is a West Timor, and it is filled with genuine, hard-working, and optimistic people. Since pictures of the remote island are far and few between, please enjoy the photostream of some of my favorites! Lisa Skowron is a Kiva Fellow serving in Kupang, West Timor, Indonesia as part of the Kiva Fellows’ 14th class. Entry filed under: Indonesia, KF14 (Kiva Fellows 14th Class), Tanaoba Lais Manekat (TLM). Tags: blogsherpa, BlogSherpa Indonesia, Indonesia, Kiva, Kiva Fellows, west timor.